A Prize for Being a Dark Park? With so much light pollution in America (and worldwide), where can you go to see the night sky alight with stars? Where does the Milky Way still brilliantly shine in a swirl of white light against black sky? There is a special award given to parks around the world that are prime star-gazing sites. 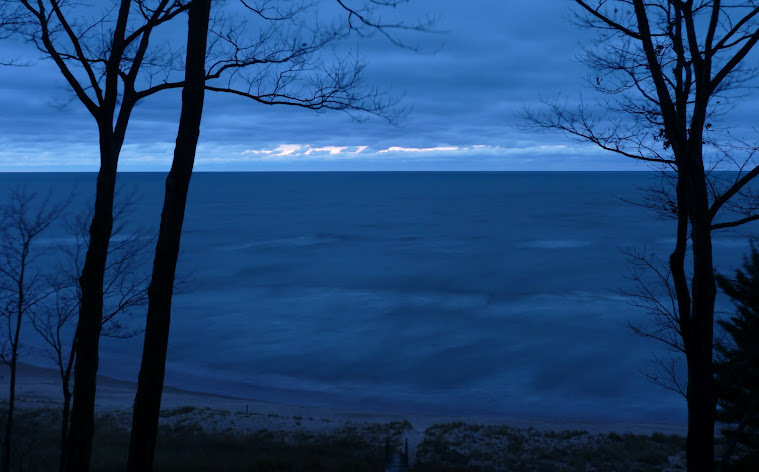 The Headlands property located just west of Mackinaw City along Lake Michigan was recently awarded the prestigious International Dark Sky Park designation . I hiked through this park on my first adventure. I might have to see the park at night this time. I saw many strange and amusing signs along the first 302 miles of my hike. This first one (above) puzzled me until I found myself standing on railroad tracks that my hiking path had crossed. I've see some dangerous areas, but never so fraught with danger that picnicking was forbidden. I thought this danger sign was pretty clear, especially with the little stick guy taking a header off the cliff. This last sign was my favorite. It was in an otherwise empty field and this was the only signage about what would be built there. stand back-to-back is my best guess. If there's a grand opening, I am THERE!! I was discouraged to see so much of the invasive grass -- phragmites -- along the shores I've walked so far. 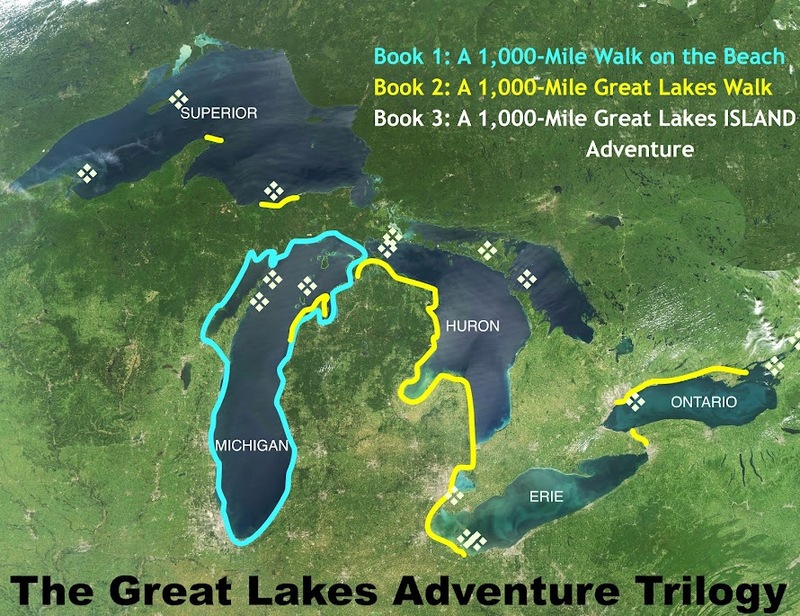 It was along the Great Lakes, along inland canals and ditches, along smaller lakes and large rivers. Invasive species have changed and warped and altered the ecosystem of our Great Lakes. I spoke to one woman who remembered that the shores near the town of Sebewaing were free of phragmites a decade ago. Today the waterways are choked with this invasive grass. There had a to be a window of time when the species was first introduced and could have been easily controlled and then eradicated. That window of opportunity has passed and now eradication will take a concerted effort over many years. 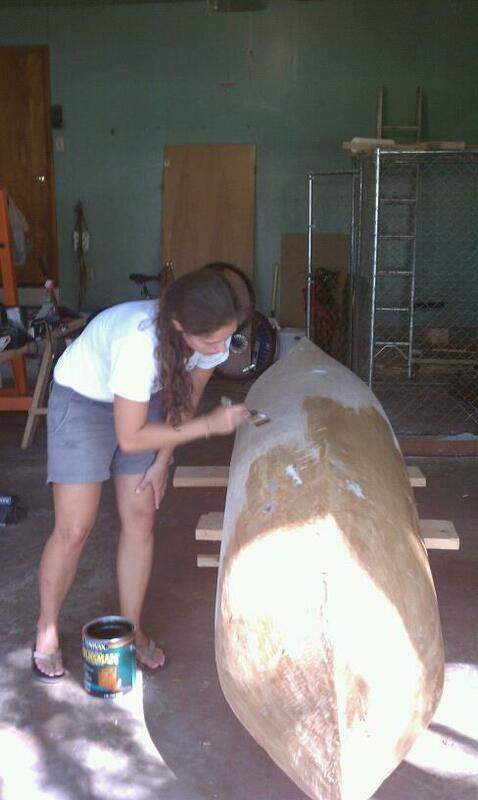 Around Lake Michigan in a DUGOUT CANOE! 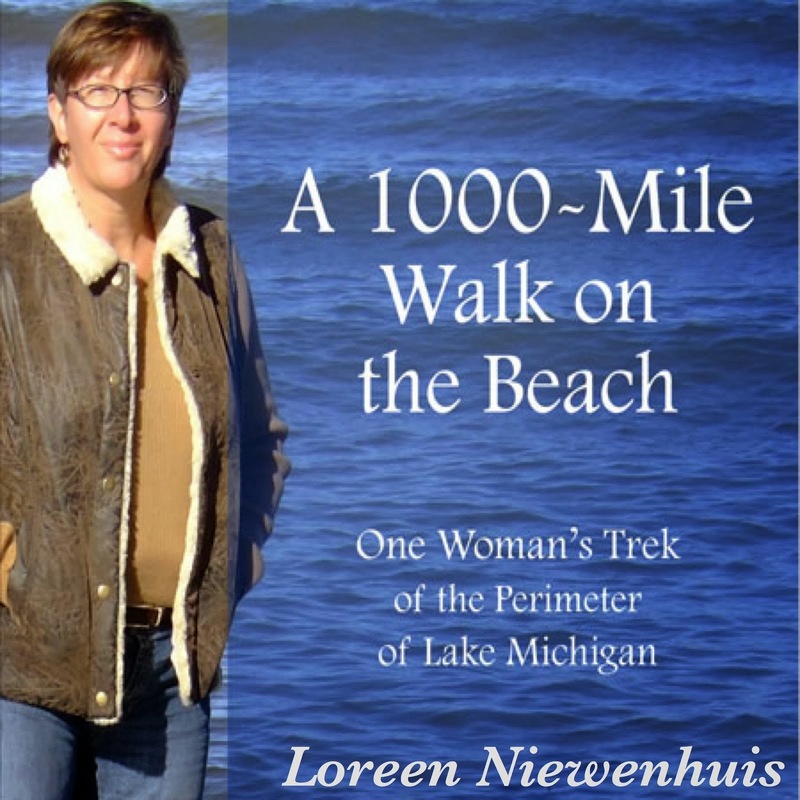 Many people have contacted me in search of information about Lake Michigan: Can I walk the shoreline between these two cities? How can I help protect the lake? I'm a sailor...what are the best cities to visit with marinas? 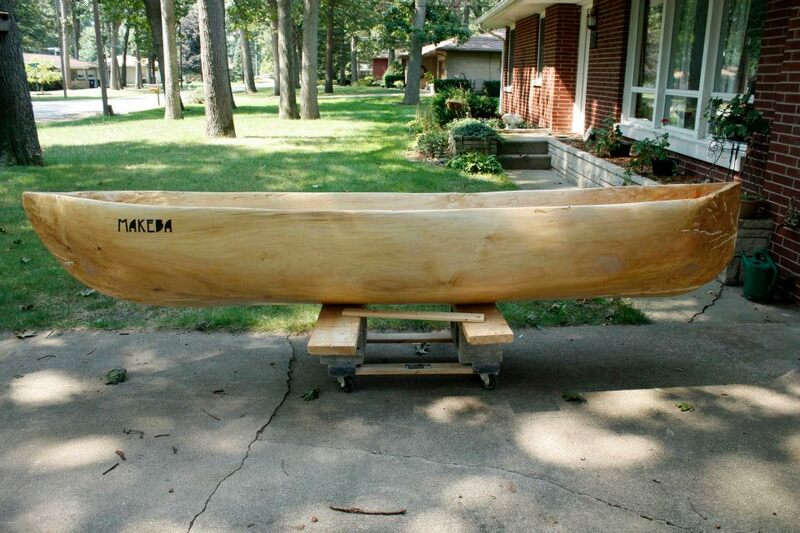 Amy Lukas contacted me recently with a unique question: My friend Mary and I are going to paddle around Lake Michigan in a dugout canoe that she made. Can you tell us about any obstacles on the shoreline? Well, this caught my attention! 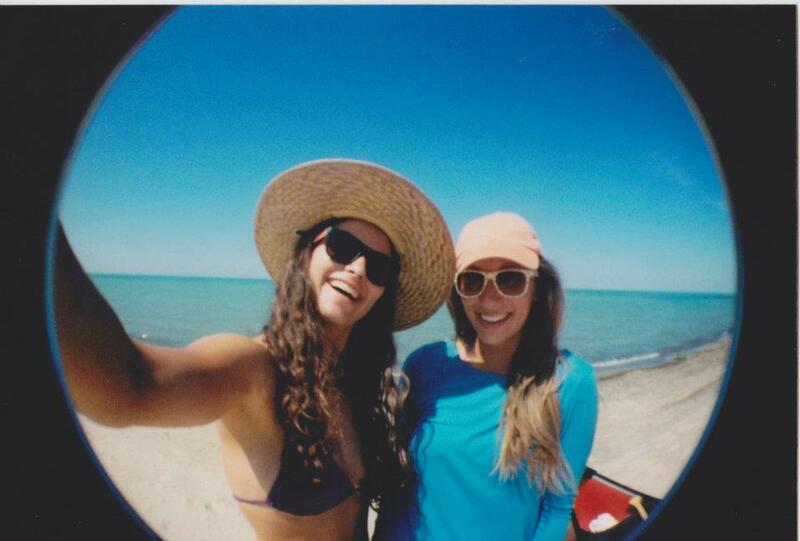 I met up with Amy in the town of St. Joseph for lunch yesterday so we could discuss their adventure. 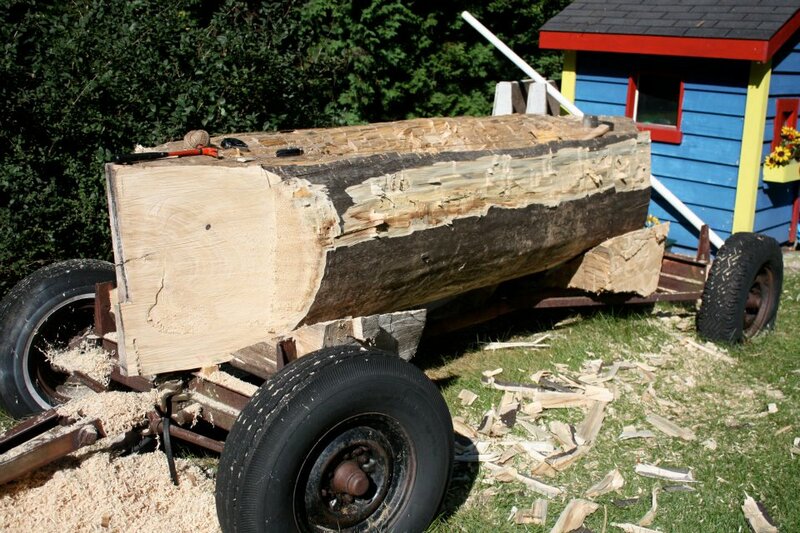 Turning a 2000-pound cottonwood trunk into a canoe! The boat is almost complete. They will attach two outriggers and a sail soon and test it on Lake Michigan. Their launch date is July 1. 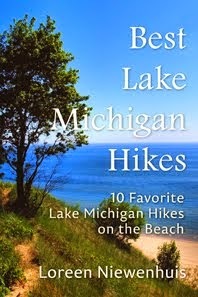 My path may cross theirs when I hike some of Lake Michigan's shoreline later this summer! Keep a lookout for Mary and Amy on the lake and cheer them on! 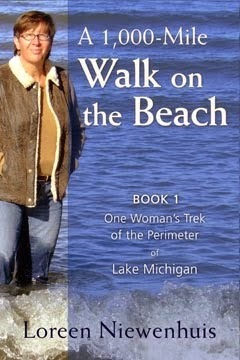 The lakeshore is made up of much more than grains of sand. that are being slowly ground away. There are many kinds of shells and the sand varies in coarseness along the way. Next time you walk the beach, look down to discover the geological and biological clues at your feet. This is the largest fresh water clam shell I've ever seen on the lakeshore. Hiking in April brings a mixture of weather and I had snow and rain and wind and warm days. Along the way, spring began to unfurl and bloom. I saw miniature mayapple groves, marsh marigolds blooming in the water, trillium in the forests, ferns unfurl, and many trees bursting into bloom. These Boots are Made for Hiking! Oregon PCT boots made by KEEN. As you can tell, they were quite comfortable! And they performed well on a variety of terrain. For the next portion of my hike, there will be more rocks, so I am moving to this even sturdier boot, the Erickson PCT model by KEEN. They have more leather and go a little higher on the ankle for support. and celebration dinner (along with many other goodies!). A shuttle will take hikers up to the city of Niagara-on-the-Lake which is located where the Niagara River empties into Lake Ontario. From there, we will hike back to the falls over portions of a Friday and Saturday in mid-October. Details and dates are still in the process of getting nailed down. I will send a mass e-mail out in the next few weeks with all of the particulars. Hotel rooms and space at the dinner will be limited, so if you want to come, please watch for upcoming e-mails. 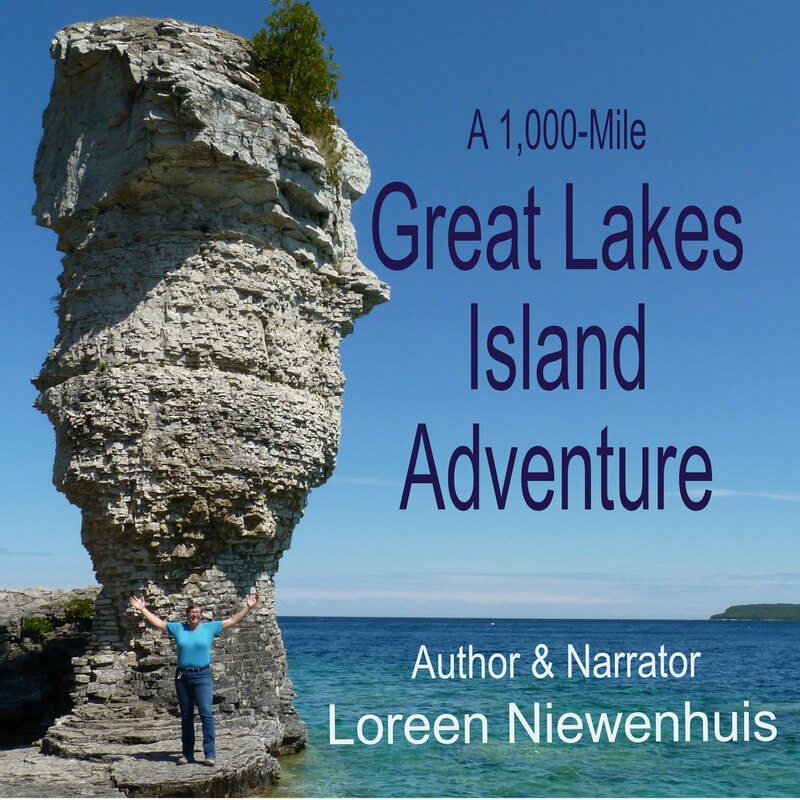 If you are NOT on my e-mail list and would like to be, please send an e-mail my way at Loreen@LakeTrek.com with "Updates" in the subject and I'll add you to my list. cross into Canada from the US. 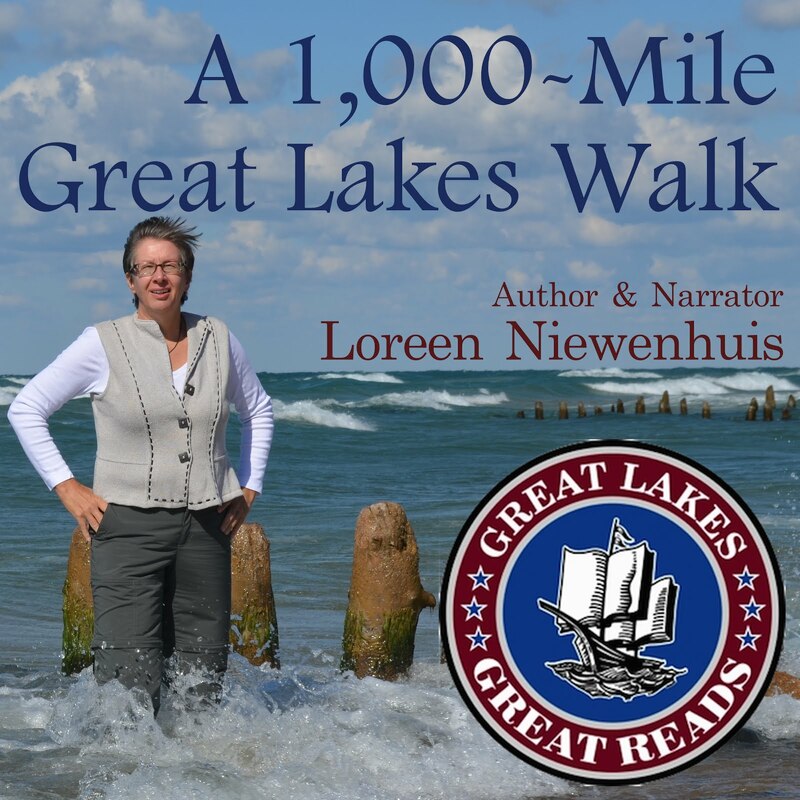 My book, A 1000-MILE WALK ON THE BEACH, was chosen for St. Joseph County's annual "One Book, One County"event! I met with the White Pigeon Book Club for a book discussion and fantastic lunch. That evening, I made my way to Sturgis for a reception at the library followed by my lecture at the auditorium. 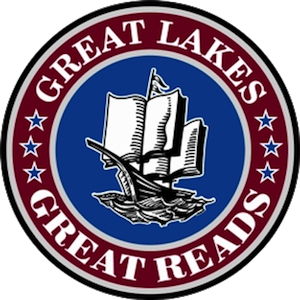 A big thanks to St. Joseph County and the dedicated librarians serving their community. And thanks to everyone who came to the event! My Mom came along to this event. What a fantastic poster they created! I always have a camera with me on my hikes and I take photos to document the sights along the way. 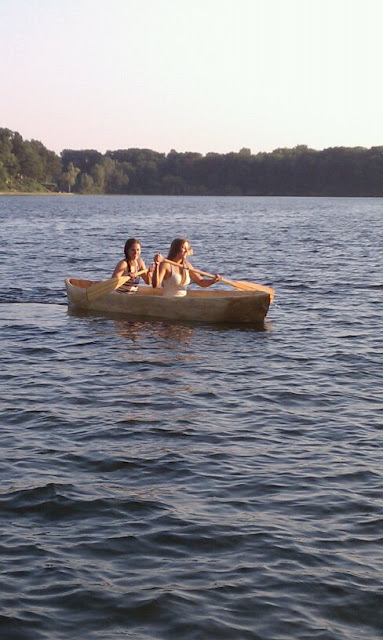 I caught some birds in flight and paddling the waves and roving the waterways. The last photo is a tundra swan near the island of Grosse Ile. This winter was so mild that there was very little ice on the lower Great Lakes. Residents of Grosse Ile told me that the tundra swans stayed there all winter and never migrated any further south. April was a blustery month and the winds seemed to congregate and explore Michigan's thumb more intensely than other areas. I had many days with sustained winds of 25 mph or better, and several days with gusts reaching 50 mph. Much of the "thumb" is quite flat with few trees, so there is little to impede the wind as it travels, so I was not surprised to see wind farms sprouting up along the way. These tall towers with their whirling blades turn that racing wind into electricity. In this last photo, I'm trying to demonstrate the strength of the wind by holding up a tissue. The waves behind me (and the wind burn on my face) probably do a better job of proving how blustery this day was! I hiked 302 miles in 23 days. From Port Clinton, Ohio, I headed west and made my way back to Michigan along the shores of Lake Erie. 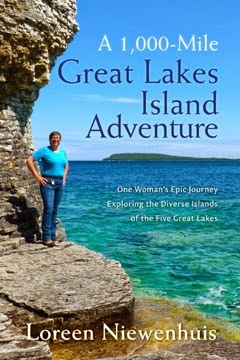 From there, I headed north along the Detroit River, Lake St. Clair, and the St. Clair River to reach Lake Huron. 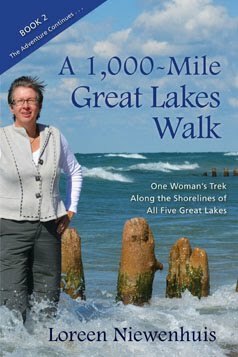 I learned so much about the geology of the lakes and their connection by walking it step-by-step. I can't wait to share the journey with you all in my next book!